Hello friends, Chitra here and today I created this CAS card using JOY TO THE WORLD stamp set. I stamped the star ornament three times using black ink and colored them using copics; then I drew the strings using a black pen. I stamped the sentiment below the ornaments and then also stamped the small stars which is in the stamp set, those are also colored in using copics. When it comes to the holidays, Hero Arts stamps are a big part of my preparations! From gift wrap to tags, cards to décor – I love decking the halls with some stamping. 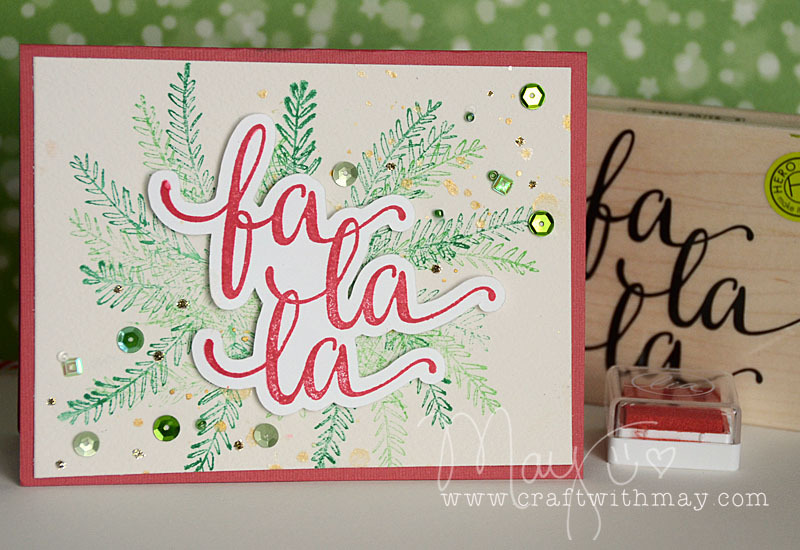 This year I find myself drawn to “fa la la” and with both a wood and unmounted stamp with that sentiment. I’ve created a video to share with you how I made this card and wrapped up this gift with some handmade touches. I had a lot of fun creating – so I hope you enjoy! And she’s also made a video. Both so delightful!! Very fun design!! What fun these cards are! The hanging stars look great and it was fun to see May's video with the nice wrapping and nice card. Fab projects. Also like that the cards are easy to reproduce (or CASE lol)! Thank you for having me play along – I had so much fun with this!! Beautiful cards! I love the elegant one layer card and the more dimensional and sparkly card. Love the hanging stars, brilliant execution. I like the bright colored stars. Cute card.